Your Partner for Technology Success! Our Infotect Consulting and Assistance Program (ICAP) provides 24/7 monitoring, alerting, asset management and regular reporting. It is the customized, premier solution for your IT Support and Managed Service needs. 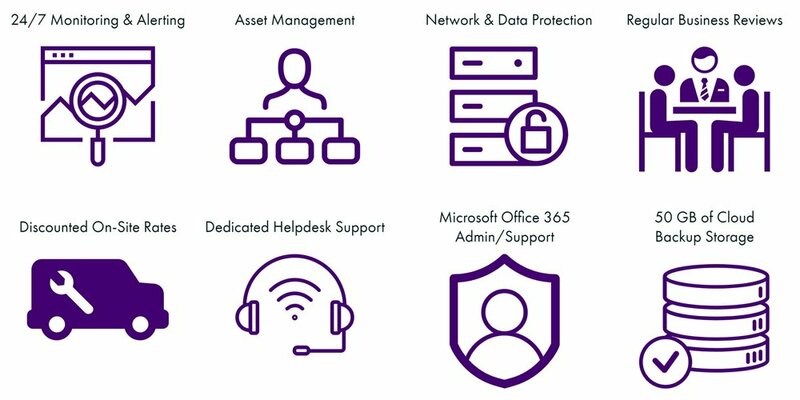 Contract options include quarterly business strategy meetings, help desk services and proactive alerts so that you always receive the highest level of service. Depending on your business systems and needs, we will create a program that will work side by side with your staff to reach your company's goals and ensure its continued success. OUR ICAP COMPLETE PROGRAM IS TAILORED TO YOUR BUSINESS PROFILE. With this understanding of our client’s business model, we provide consulting, networking, web site/application development and project management. Our comprehensive experience in specific industries including non-profits, construction, medical, and local government lends us the expertise to customize our program to suit your business needs. Fill out the form below to get in touch. We look forward to learning more about your unique business needs! Network Security focuses on perimeter protection and good policies. Internet-facing systems are vulnerable to attackers from all over the world. The more services you host, the more risk you create. ICAP includes firewall administration so network security is never optional. We help build the good policies and protocols that help protect your network. The desktop or endpoint is the most common point of access for malware and viruses. It is necessary in the modern workplace to use the Internet so endpoint protection is crucial. ICAP provides centrally monitored protection using industry-leading technology to prevent and stop infections. Custom policies allow for additional security based on your needs. We can even protect company phones and tablets. Data Protection is the process of safeguarding important information from corruption and/or loss. A data retention policy is a recognized and proven protocol within an organization for retaining information for operational use. Your ICAP program will include our guidance on policies that meet data protection and retention laws and requirements. We’ve partnered with 3CX to bring you an innovative VoIP solution! Voice-over IP (VoIP) simplifies many communications processes, lowers expenses, and adds convenience, delivering greater versatility and more features than ever before. Whether you choose an on-premise or cloud managed infrastructure, utilizing your dedicated Managed Service Provider to bring you a VoIP solution will ensure that you are getting all the features bundled with the best service possible. Subscribe for monthly deals & news! Thank you! You should receive a welcome message shortly!